Quercetin benefits the body in a great variety of ways. What is quercetin and how can it do so much? 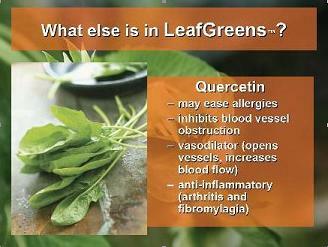 Quercetin (pronounced KWAIR-sit-in) belongs to a class of water-soluble plant pigments called flavonoids. It is found in onions, apples, green tea, black tea, leafy green vegetables and beans. It is a potent antioxidant combating the destructive "free radical" molecules that play a part in many diseases. Research into plant flavonoids is fairly recent so expect more benefits to be discovered. Quercetin inhibits the aggregation (abnormal clotting) of platelets, fibrin and other blood components and thus has an anti-clotting function that can help improve circulation. Quercetin protects the lens of the eyes from opacification (becoming cloudy) and oxidative damage from the high levels of hydrogen peroxide common in people with cataracts. It is a strong inhibitor of an enzyme that plays a part in the formation of diabetic cataracts, neuropathy, and retinopathy. Quercetin reduces the production of uric acid by inhibiting xanthine oxidase, and thus can ease gout symptoms. Quercetin reduces allergy symptoms especially those to pollen by inhibiting the production and release of histamine and other allergic and inflammatory substances. It has been shown in lab studies to reduce the effects of IgE mediated reactions. It may also be helpful for hayfever, hives, sinusitis, asthma, and inflammation disorders. Quercetin reduces joint inflammation. There have been several reports of people who increased their flavonoid intakes and felt symptomatic relief from rheumatoid arthritis and fibromyalgia. Improves the health of capillaries and connective tissues. Quercetin can help with alleviating bruising, edema, varicose veins, and fragile capillaries. Quercetin has shown in test tube and animal studies to have anti-cancer effects. One study suggests that quercetin is helpful for prostate health. Preliminary studies indicate that quercetin may inhibit the proliferation of androgen-independent human prostatic tumor cells. Test tube, animal, and some population-based studies suggest that quercetin may reduce the risk of atherosclerosis. It enhances the action of vitamin C, another antioxidant. Quercetin appears to be one of the first plant compounds proven in a double-blind, randomized, placebo-controlled clinical trial to reduce susceptibility to viral illnesses such as the common cold. (Med Sci Sports Exerc. 2007 September. Nieman DC, et al.. Department of Health, Leisure, and Exercise Science, Appalachian State University, Boone, NC). This may one of the quercetin benefits with the greatest potential. Quercetin provides significant symptomatic improvement in most men with chronic pelvic pain syndrome. Quercetin may protect brain cells from damage. Rat brain cells exposed to the antioxidant quercetin resisted damage much better than those not treated, a team at Cornell University in New York found. Quercetin also increases mitochondria which are the organelles in every body cell that produce energy. Mark Davis, Director of the Psychoneuroimmunology of Exercise and Nutrition Laboratory at the University of South Carolina in Columbia (It's an exercise just saying all that!) found that mice given even fairly low doses of quercetin for seven days had a 30% increase in the number of mitochondria in their muscle and brain cells. As you can see, quercetin benefits the body in many different ways. Quercetin is very safe to take but there are a few possible side effects and precautions. Read about a natural source of quercetin. with many additional benefits and a higher antioxidant capacity than acai, blueberries or mangosteen. This is a product that can help you in many ways to attain the health and vitality you want.